It’s been one of those weird victories for the Knicks that was not supposed to happen but you can’t blame them for it either. 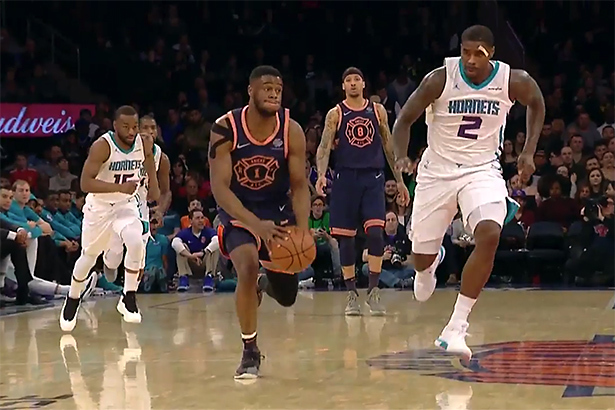 With Frank Ntilikina putting up a career game, the Knicks outran the Hornets 124-101 at the Garden. What made it even more weird was the third quarter, which, compared to what New York used their fans with, was completely different. This time, the Knicks stormed their opponents scoring 42 and allowing only 17 in what was probably the best quarter played by the Orange & Blue this season. Enes Kanter, who dropped 9 points and 9 rebounds was very vocal against tanking since the beginning of the week and after Hornacek questioned his players whether they accept losing too easily, they seemed to show a different attitude, as noticed by the Post. Tim Hardaway Jr led his team with 25 points but the big news came off the bench. Ntilikina finished with a career high 15 points, shooting 5-8 from the field. He also added 3 assists and 3 steals drawing praised from his coach. The bench was a major contributor last night as the second unit outscored the starters 72-52. Trey Burke scored 14 points and dished 5 assists, Troy Williams dropped 13 and Isaiah Hicks added 12 buckets and 8 boards. For the visitor team, Dwayne Bacon led with 15 points off the bench, Dwight Howard posted 14 buckets and 13 boards while Kemba Walker and Marvin Williams scored 10 points each. Former Knick, Willy Hernangomez played 13 minutes, scored 9 points and grabbed 6 rebounds. The Knicks snap a 9 game losing streak but take a step back from the lottery after getting a huge present from the Sacramento Kings who took a big W against the Golden State Warriors just a night before.